We’d love your help. Let us know what’s wrong with this preview of By Mistake by Viveik Pandit. "The so-called exacting lives are not planned, they happen... by mistake"
The above forms the premise of the debut novel by Viveik Pandit. By Mistake is author s attempt in re-phrasing the oft repeated talk of destiny shaping our lives . Lucknow forms the prominent backdrop of the story of By Mistake, both the contemporary Lucknow as well as the nostalgic city. Shantanu Sridh "The so-called exacting lives are not planned, they happen... by mistake"
Shantanu Sridhar, a drift-wood, is on a re-visit to his home land, Lucknow, after a fairly long hiatus. What follows, is an enigmatic portrayal of his travails that carry more than just a hint of intrigue and passion. To ask other readers questions about By Mistake, please sign up. A well written book,it strikes a perfect balance between humour and an interesting plot that kept me hooked till the end.Even though it is the author's first novel he's done a remarkable job.Keep up the good work,Mr.Pandit. Finally we have a great read. ‘By Mistake’ is an effort by Viveik Pandit. Though this is his first novel, he has got a lot of experience in the field of writing. He has been associated with journalism since long and has a coffee table book to his credit. I am elated to find that such a great piece of literature has been penned down in the ‘New Age’ literature section. Shantanu is an MBA grad from Munich and has come back to India after a long stay at Canada after being dumped by his long time gir Finally we have a great read. 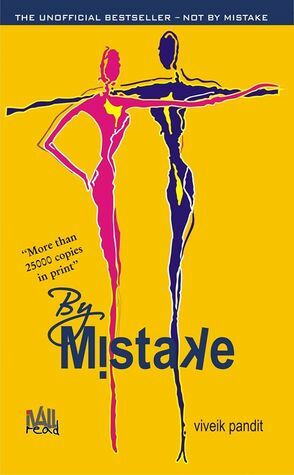 ‘By Mistake’ is an effort by Viveik Pandit. Though this is his first novel, he has got a lot of experience in the field of writing. He has been associated with journalism since long and has a coffee table book to his credit. I am elated to find that such a great piece of literature has been penned down in the ‘New Age’ literature section. Shantanu is an MBA grad from Munich and has come back to India after a long stay at Canada after being dumped by his long time girlfriend Jasmine. He meets Pranish and Shail, his old friends and drives off to Kasauli from Delhi. And the most unexpected time he gets to meet his childhood crush and first love, Kavita who had since long been teaching at Nainital. In between he even helps out a few school boys of the same school wherein Kavita teaches. Kavita had been married off to Rajeev but he was a wife abuser, someone who believed in domestic violence. She could handle it no more and walked out of the marriage. She even had a two year old son, Adi whose custody still lay in the hands of the court. He spends sometime with them and proposes her too. And obviously Kavita declines. Meanwhile they have a college reunion at Lucknow where many of them question him about Kavita. He waits for her to see him at the farewell but she doesn’t come. Shantanu is hell bent on getting Kavita. He helps her fight Kavita through her divorce. Rajeev sends her a legal notice for the custody of their son, Adi wherein she’s helped out by Shantanu as well as her college friend. Will Kavita go back to Shantanu or not? Will Kavita get Adi? This is for you to find out. The debut novel by the author has all the flavours of contemporary urban life. It becomes an interesting and compelling read as you move through the well knitted story. The subtle sense of humour comes alive at many places and makes it a completely enjoyable read. By Mistake..a debut novel of Vivek Pandit is worth reading & story revolves around childhood love which did not got the opportunity to bloom on right time..Kavita could not understand the love of Shantanu for her..she confided in Shantanu but only as a best friend..many times it happens..but after years they happen to meet under odd circumstances...both were recovering from past relationships which had wounded hearts of both and this instance proved to be a boon for Shantanu...inspite of all odds finally they reunited. Just another boring book. 'By Mistake' is a really dissapointing book. Most of the books are written in a person's point of view, man but the narration? Really? There are too many gramatical errors in the book. The author may speak very fluent english but she should also care about his readers. A total bore. Viveik Pandit, the best selling author of 'By Mistake', '21 New Beginnings' and 'Raani', is a freelance journalist, a professor and a trainer. His written expressions have found space in newspapers and travel magazines. He has penned four coffee table books on different subjects, “Devalaya Uttaranchal”, Devalaya UttarPradesh”, “Magadh” and “Business Icons”. He has also written scripts for short fi Viveik Pandit, the best selling author of 'By Mistake', '21 New Beginnings' and 'Raani', is a freelance journalist, a professor and a trainer. His written expressions have found space in newspapers and travel magazines. He has penned four coffee table books on different subjects, “Devalaya Uttaranchal”, Devalaya UttarPradesh”, “Magadh” and “Business Icons”. He has also written scripts for short films and advertising campaigns. Pandit's students come from the diverse domains of management, engineering, journalism and finance. He has found his oasis in writing. His children still refuse to read him, so he has taken to writing for children as well. A multi-series book, titled 'Donna' saw a 2015 release. Viveik Pandit aspires to give cinematic expression to his works. He lives in Lucknow, India, with Anjali and two children.